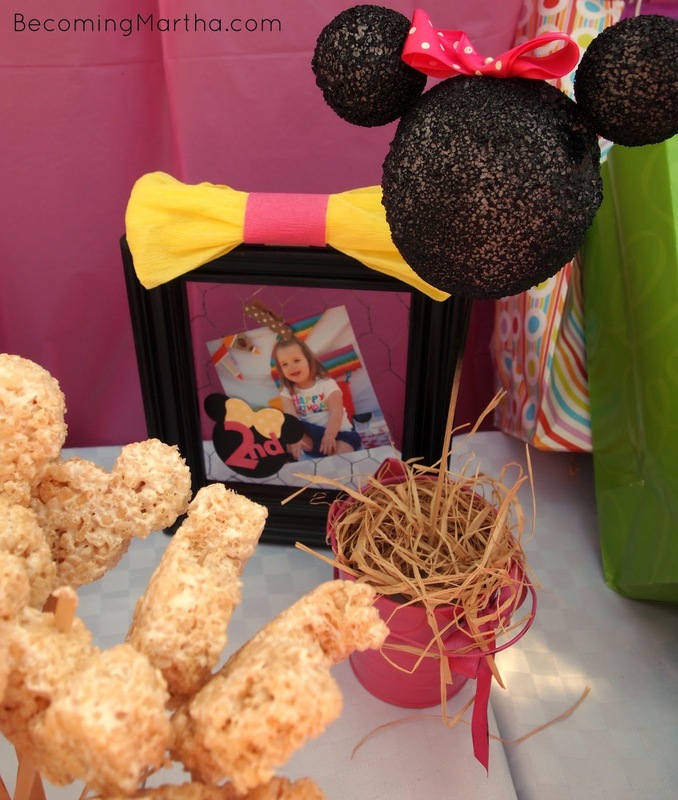 Today, I am sharing the last post from my daughter’s Minnie Mouse party that we held a couple of weeks ago. So far, I have posted about her party favors and the party games and activities. 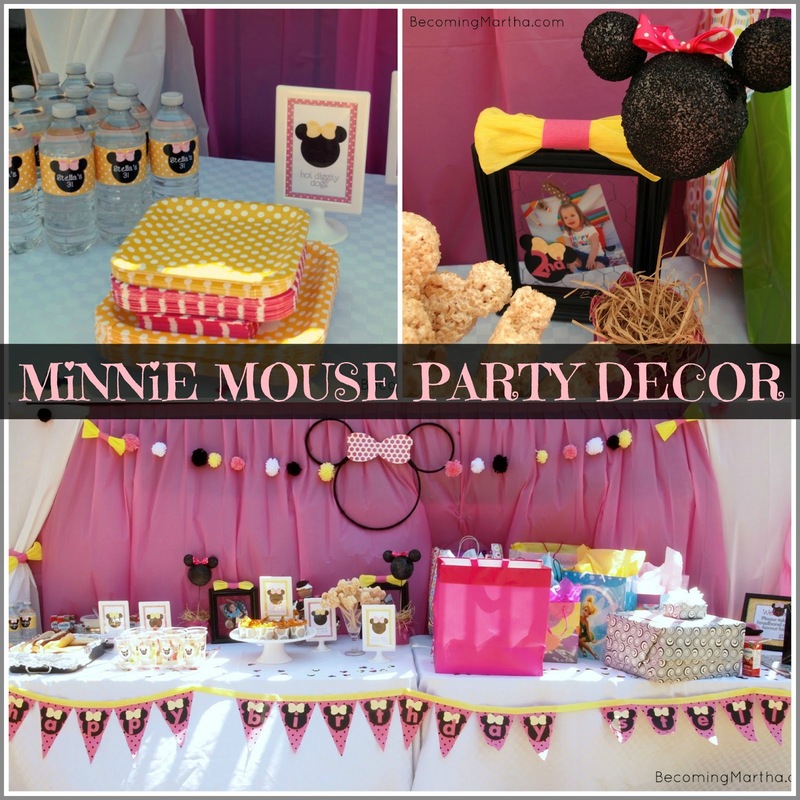 Today, I’m going to share some photos from the decor, and you can head over and download a set for your own Minnie Mouse party! 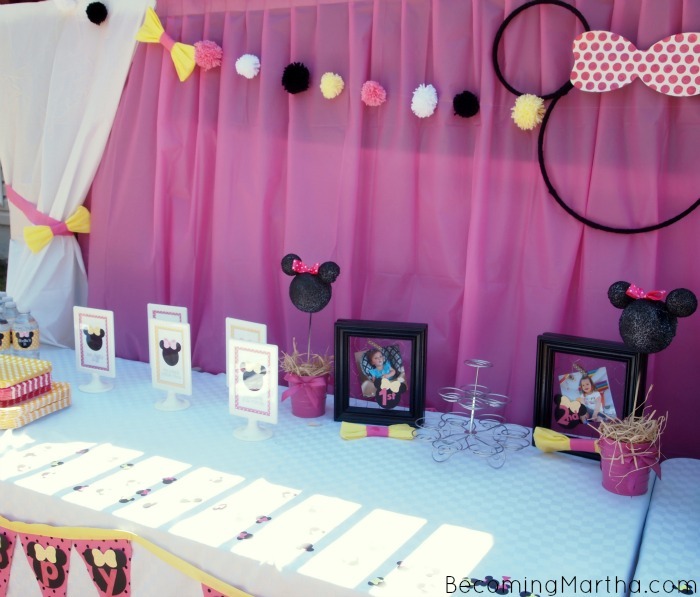 When I started planning the decor, I knew I didn’t want either of the standard Minnie Mouse color themes – no black/red/white or black/hot pink/white for this party. I kind of went with a strawberry lemonade color scheme first, but when it started to look a little too babyish (from the colors being slightly pastel), I upped the brightness factor. I also used some black, grey, and white for neutrals. My daughter loves polka dots, so I tried to incorporate them wherever I could – plus it ties in nicely with Minnie Mouse since her dress and bows often have polka dots. I created all of the printables myself, and had them printed at a local office supply store. I tried to use things I had on hand as much as possible to keep the cost down. 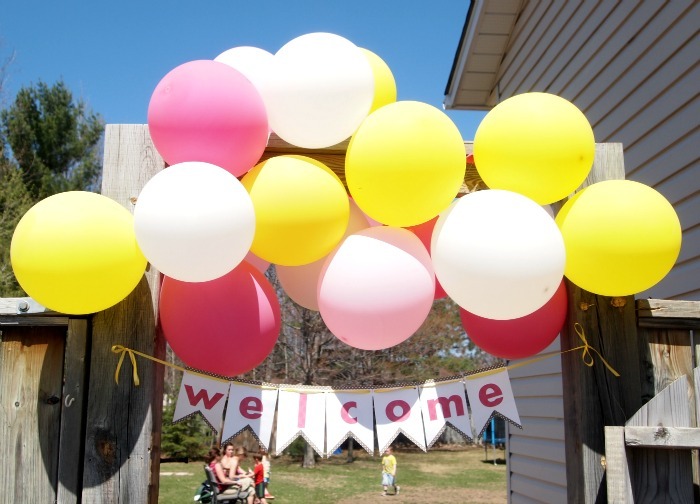 I created this welcome banner by cutting flag shapes out on my digital cutter and lining the edges with washi tape. I also cut the letters out of scrapbooking paper and then strung the banner on yellow ribbon. I hung it on the gate with a balloon banner. To make the balloon banner, simple blow up all of your balloons and use a needle and thread to string the balloons on the fishing line. Obviously, make sure you thread it at the bottom of the balloon, past the knot, so it doesn’t pop! Then, I wrapped the string around the top of our gate. 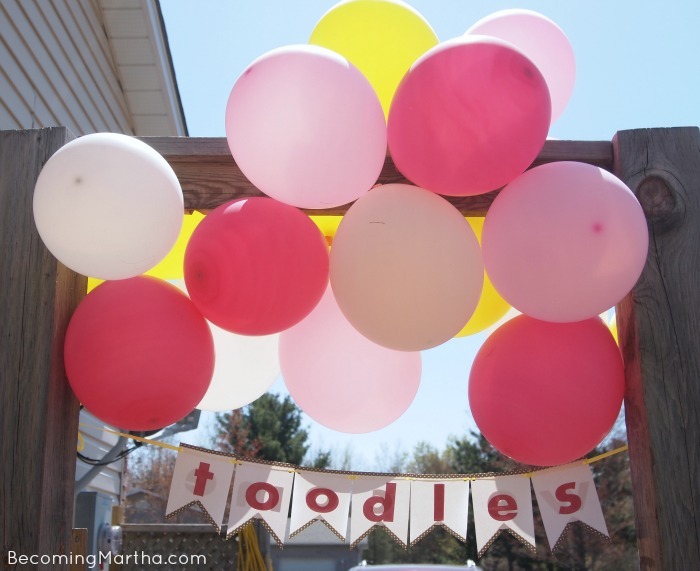 On the reverse side of the banner, I cut the word “Toodles” which the guests saw as they were leaving. Most of the decor focuses on the food table. To make the backdrop, I stapled vinyl tablecloths to the back of my deck. I tied the white vinyl tablecloths back with pink streamers with crepe paper bows. The wind was blowing like crazy, so it was hard to get a good shot of it all! 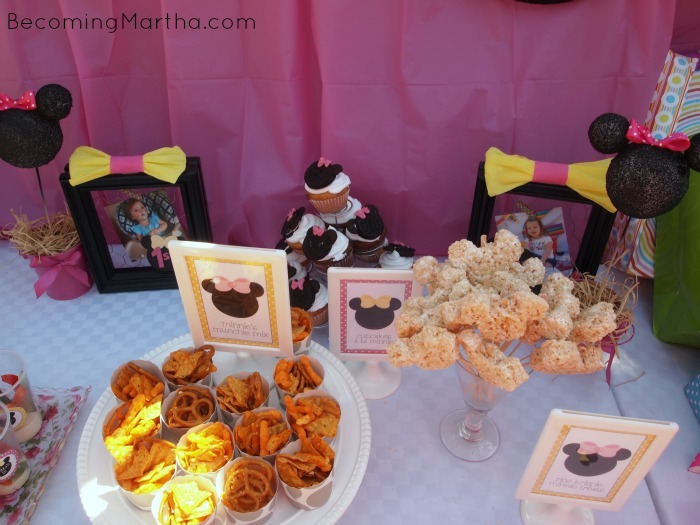 The tablecloth was sprinkled with Minnie Mouse confetti that I ordered from an Etsy Store, Creations by Stephanie. I could have made my own, but I know when to say enough is enough and order in. There was no way I had time to create 300 pieces of Minnie Mouse silhouette confetti with bows glued on, especially when I could order them for $3.00! Water bottle labels have to be my favorite element of any party – and I always create them! I think they are a very easy and simple touch that really top it all off. I have them included in the printables package that I’m sharing – in both yellow and pink colors! I wanted to keep the food simple so that I could spend more time enjoying the party (which still didn’t happen, it is apparently impossible!) 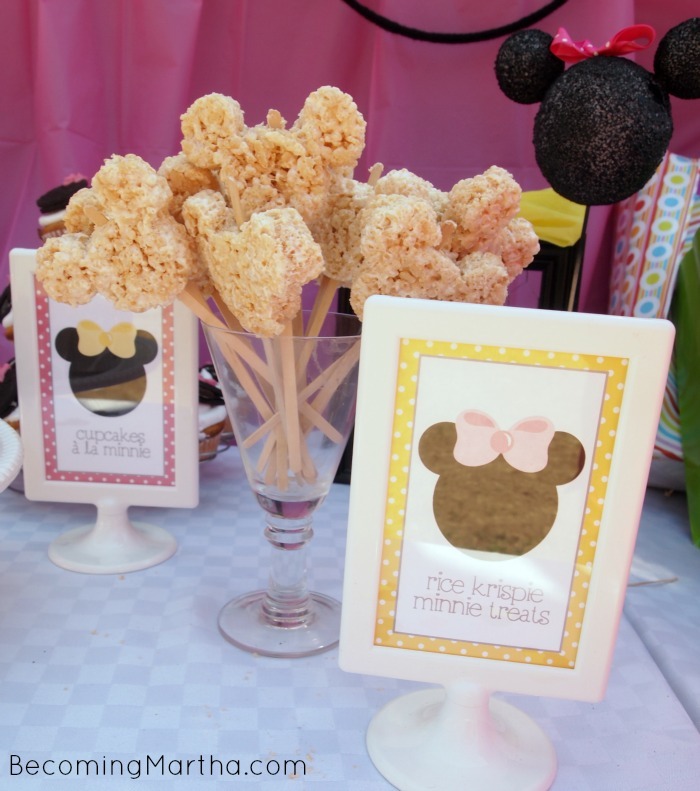 I created Minnie Mouse rice krispie treats, which were supposed to get bows but since it was a last minute rush, the bows didn’t make the boat. I simply used a Mickey Mouse cookie cutter that I ordered from Amazon. 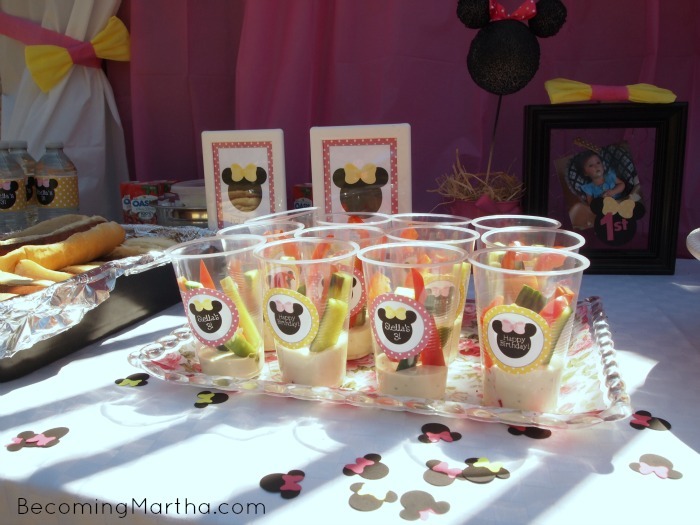 The guests munched on hot dogs, personal veggie cups, and munchie mix. We had cupcakes and rice krispies for dessert. The banner is also one of my favorite elements – it was a night before last minute addition that I was super happy with. It was super easy to create too – I will share a tutorial for it next week – and guess what? It’s no sew! In the chicken wire frames, I put pictures of Stella from her first and second birthday. I stuck more crepe paper bows on top of the frames. The cupcakes were the semi-scratch/semi-boxed cupcakes that I shared when we had Cecelia’s party – seriously the best cake recipe ever! I topped them with white (store bought) icing and made Minnie silhouettes with oreos, mini oreos, and pink frosting for the bows. And if you wanted to grab a free copy of the Minnie printables, head to my facebook page and click on the free download tab – and contact me if you would like to place an order through Etsy to have them customized or order the matching invitation. I hope you enjoy them! And if you use them for your party, feel free to send me some pictures of them in action. I love seeing party photos! Everything turned out adorable! I love it!!! You did a wonderful job! I am finding your link to day on Live Laugh Rowe! I would be so happy if you would come by and link this party up at my link party; Party In Polka Dots!! I hope to see you there! So cute Sarah! Looks like Stella had an awesome birthday!! Did you ever post your tutorial on how to make the banner? If not can you please do or email to me. Thanks. I love all the Party Decor! 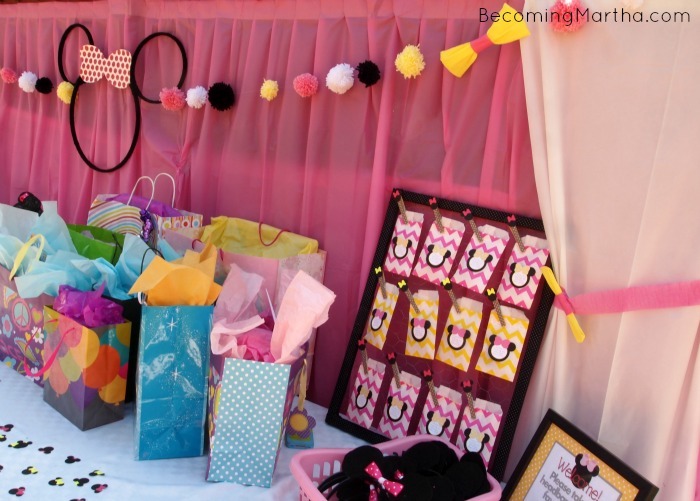 I’m planning a Minnie party for my 3 year old as well. Thanks so much for the free printables. I also love the white pedestal frames, and could use those from year to year on parties. Would you mind sharing where you purchased those? Thanks! Sure! Those are from Ikea – 99 cents!! You can get them in white and a few other colors I think, but white seemed the most versatile to me. Can you send me an email – [email protected] – and we can discuss what you need? Thanks! 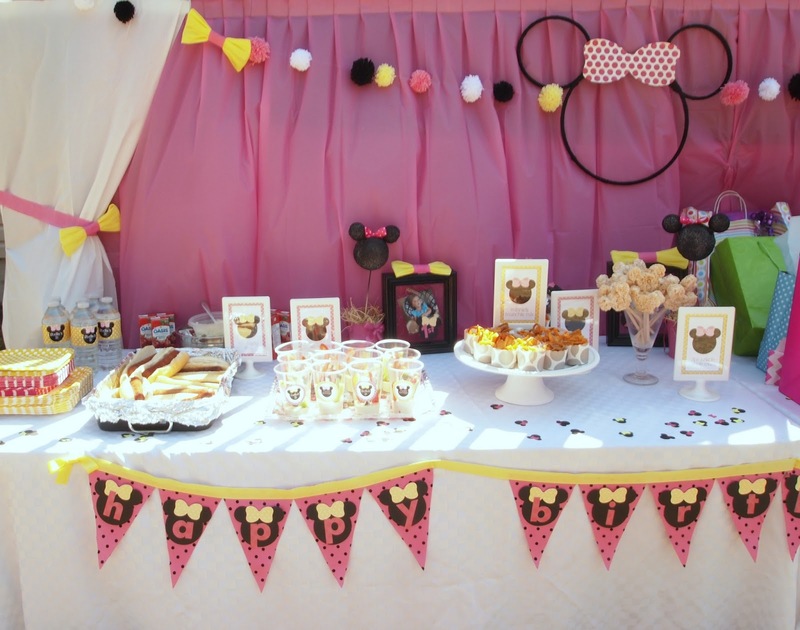 I am trying to find the tutorial and printables for the minnie mouse party… please help me.i also cant seem to get back to the page with the minnie confetti provider…. 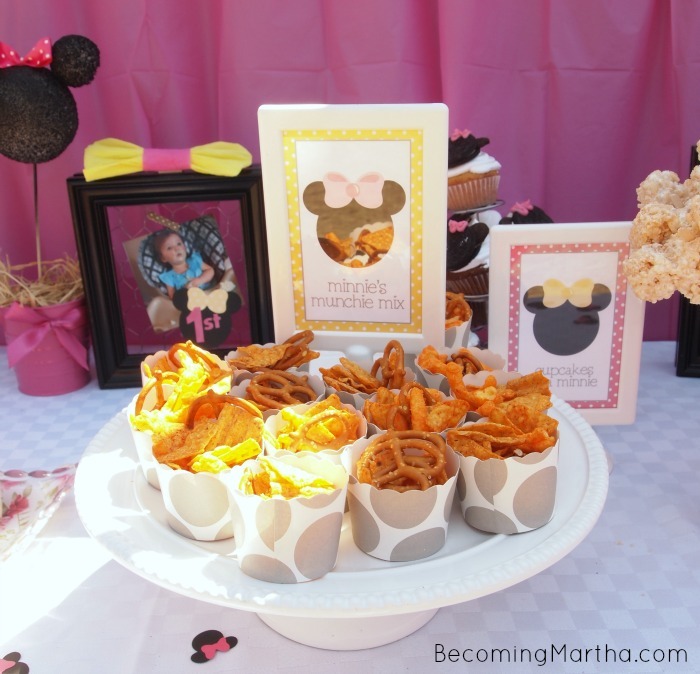 The printables for the Minnie Mouse party are under the freebies tab on my facebook – but hurry, they will only be there another day or two. After that, they will be available for purchase in my Etsy store. If the link does not work to the Etsy store, just search Minnie Mouse confetti and you may find someone. The person I used may have closed her shop. What a wonderful party! It looks so pretty! I love planning my son’s birthday party and have done a Monster Bash (http://everydaywithlisa.blogspot.ca/2012/10/its-monster-bash-birthday.html) and an Imagination Movers Party. I am now doing the decor for my nephew’s birthday party (Dinosaur Train themed). Thanks for the new idea’s, I’m happy to be a new follower! I do have a problem with download. There is a tab in my facebook page that says Free Download. It is near the top. That is what you must click to download the files.